On Saturday I had a chance to finish what I started. Last week I watched with large amounts of skepticism and doubt as upstart country star Taylor Swift won Entertainer of the Year among other CMA awards. Then in my post the morning after I mentioned that Swift was up against some stiff competition a group of veteran entertainers that included pop country music star Keith Urban. I didn’t mention this in on the last post but, to be honest with you, I’m not the biggest pop country fan. 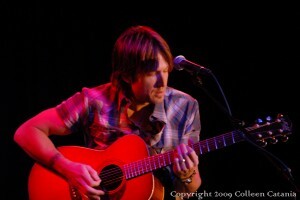 I’m more a fan of the old school style of country or alt-country. For whatever reason the old school just seems to sing songs that are more genuine, believable and life-saving to me. But I’ve never given up on pop country because there are gems to be found. And I’ve never let not digging a genre of music stop me from putting my own ideas and prejudgements to the test by experiencing an artist’s live show for the first time. Because I know by now that anybody can make an album and sell millions of records. But it’s the real artists who can put on a great live show and separate themselves from the rest of the pack. And from what I’ve seen via YouTube, CMA’s and other videos Keith Urban seemed like a guy who knows how to put on a great live show. So I decided to see for myself if that was indeed true. 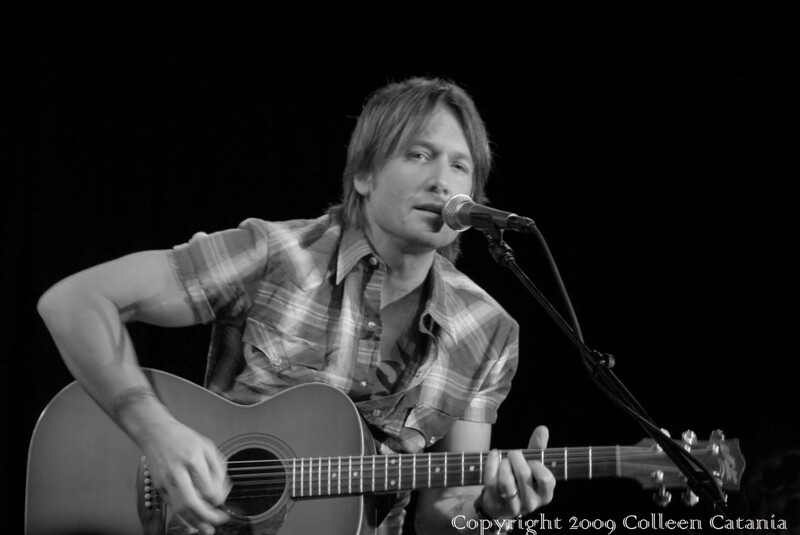 Keith Urban’s exclusive show at Joe’s Pub in Chicago on Saturday afternoon gave me the chance to experience first hand why he would be nominated for Entertainer of the Year. I not only saw his performace but I also had the chance to talk with his fans. Since there’s more than one story during a live show, it would only make sense if I told this Keith Urban concert story in Two Parts. First, in Part One, I’ll take you through Urban’s performance, including the revealing and candid Q & A he had with fans during which the ladies fired off some pretty impressive questions. Then in Part Two (via a separate post) we’ll look at the show through the eyes of two Urban fans I spoke with. They both had compelling stories to tell about this and Urban’s other live shows involving Taylor Swift. Since Urban’s performance was a stripped down and solo acoustic version of what fans experienced during his recent “Escape Together World Tour,” this show’s audience was probably one of the most intimate that I’ve been a part of this year. The other important part about this show was that it was sponsored by Verizon Wireless and Samsung Mobile which is the same team behind Urban’s user-generated content fan website kuconcert.com. So most of the fans in the crowd won their tickets by going to local Chicagoland Verizon Wireless stores while others won tickets via local country radio station US99. With that in mind I knew this crowd was going to be intense and fans were expecting nothing less than a great show. So as I walked around and talked with fans I wondered what would happen if Urban didn’t deliver. The buzz of excitement increased as fans chatted loudly amongst each other swapping stories about Urban and how they won their tickets. An odd mix of early afternoon booze and sweet perfume wafted throughout the venue confirming my assumptions that I would be in the extreme gender minority. But I wasn’t worried because my wife Colleen, who was taking photos, pointed out that Chicago Bears Tight End Greg Olsen in the crowd. I figured I could go stand by him if things got ugly or if I felt lonely. And for those of you who might be wondering–Nicole was NOT in the house. When Urban walked on stage a crop of cellphones and video cameras instantly sprouted up, quickly followed by a simultaneous eruption of screams, cheers, woo-hoo’s. Then just as Urban strummed the first chords of “Days Go By,” a fan who I talked to before the show started surprised me and gripped my arm excitedly. She pointed at the stage and shouted to me “that’s the song I was telling you about! I’m so excited that he’s playing it!” I looked around the venue and saw a flock of dreamy faces reflecting deep and whoozy sense of pleasure. And almost in perfect time, fans swayed back and forth to Urban’s swoonin’, sweallin’ and rockin’ ballads. Urban unfurled versions of “Kiss a Girl” and “I’m In” from his latest album Defying Gravity. And like a gifted showman who knows his audience perfectly, he relied heavy on the energy of the crowd who knew every word to every song and made the choruses soar just as well–if not more than–an arena crowd could. These ladies (and a few guys) were serious and expressed their love on every lyric and every note. The in-between-songs Q & A added a strong emotional undercurrent and personal pace that your don’t see at regular concerts. One lucky fan had the pleasure of going up on stage to have a poster signed and her picture taken with Urban. And one fan candidly told Urban that his music has gotten her through some very tough times as she struggles in the wake of losing a family member, while other fan asked what band he would want to be in if he could, Urban surprisingly said the Beatles. At the end of the Q & A, as Urban wrapped up his set, more screams and cheers exploded when he mentioned that a future collaboration with pop balladeer and underrated blues guitarist John Mayer might be in the works. 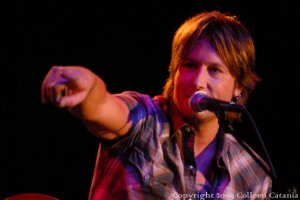 So am I a Keith Urban Fan now? But I’m closer to becoming a fan than I was before the show. My favorite moment was Urban’s delivery of the lyric in “Kiss a Girl” when he sweetly crooned “…are you ready to cross that line, then put your lips on mine..” In the context of that song and that moment as I was surrounded by a crowd of women who were probably thinking of doing just that, I have to say it’s one of my most memorable concert moments this year. And thanks to the fan stories coming up in Part Two, I now have more respect for Taylor Swift and understand why Urban has such loyal, loving and committed fans. Were you at the show? What did you think of Urban’s performance? His Daugher’s name is Sunday (not Someday!). And the song title is “Kiss a Girl” not kiss the girl. You need to become a fan so you get this stuff correct! Thanks for the note Janet. Sorry ’bout that. Changes are made.